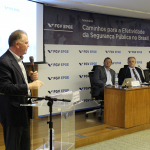 The Graduate School of Economics – FGV EPGE promoted on November, 17 the seminar “Pathways to Effectiveness of Public Security in Brasil”. The seminar gathered specialists to discuss paths to build effective policies to promote social peace. The debate main themes were the structural reforms needed to improve indicators of public security in Brasil and the local level security policies implementation. The event was attended by Arthur Trindade Maranhão Costa, Federal Distric’s Public Security Secretary, Daniel Cerqueira, IPEA’s Researcher; Eduardo Santos de Oliveira Benones; Republic Attorney responsible for the external control of police activity in Rio de Janeiro, José Renato Casagrande, Espírito Santo’s former Governor; Luiz Eduardo Soares, former Public Security National Secretary; Renato Sérgio de Lima, President of Brazilian Public Security Forum e Rubens Penha Cysne, FGV EPGE Dean.